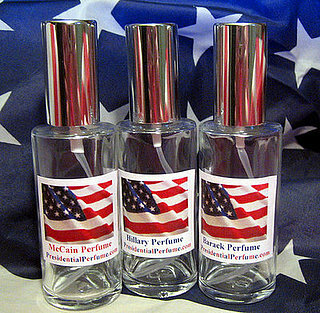 Would you want to smell like Hillary Clinton? How about like Barack Obama or John McCain? April Cline hopes you do. The West Virginian woman has created a line of fragrance called Presidential Perfume just in time for the down-and-dirty politickin’ season. Hillary: a “delicate floral” with notes of jasmine, violet, rose and musk. Barack: an energetic scent with notes of bergamot and musk. So, who would YOU want to smell like? Based on the descriptions, I would choose the Hillary perfume. Based on who i’m voting for, well that’s a whole ‘nother subject. Ever wonder what George Washington’s sent was? Bet it was more of a musky smell as opposed to a light orchid sent. Sometimes cologne smells good, but it doesn’t last….